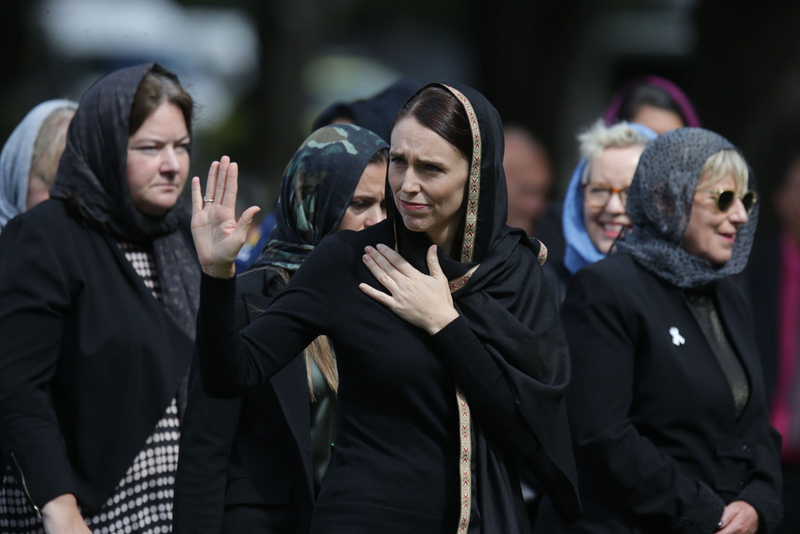 In the wake of the massacre in Christchurch, the New Zealand government led by 38 year old Jacinda Ardern has been doing everything it possibly can to disprove the oft-repeated mantra that terrorism will not change us. Before the echoes of the shots had faded completely they’d decided to impose new restrictions on the ownership of firearms, consistent with the knee-jerk reactions of other governments in the wake of a shooting spree. Within days the image of Arden wearing a headscarf was splashed across the pages of the global media, followed by campaigns encouraging all women to get with the program. Tomorrow, the Islamic call to prayer will be broadcast across the whole of New Zealand in a sign of solidarity. Meanwhile, a New Zealand bookshop has pulled Jordan Peterson’s bestselling book from the shelves, the police are arresting people for sharing the video, and ISPs are now blocking 4chan. All this within a week, but apparently terrorists will never change us. Overseas things aren’t much better, with everyone clambering over the corpses of those massacred in Christchurch to justify what they’re doing anyway. The British police are doing their usual thing of arresting people for nasty words on the internet, US Democrats are blaming Donald Trump, Brits are blaming Brexit, Recep Tayyip Erdogan is using footage of the attack to fire up the crowds at public rallies in Turkey, and the usual bunch of lunatics have come out and said all white men are the problem. The opportunism doesn’t bother me so much; activists and politicians have been doing this since time began. What I find more interesting is people’s opinions of Jacinda Ardern. Her reaction was one of a mother who’s infant son has just fallen over and grazed his knee: endless soothing words, sympathetic grimaces, lollipops, and promises of a safer world in which knees don’t get grazed. I’m not likening a gun massacre to a grazed knee, rather I’m saying a prime minister should display the characteristics of leadership not motherhood. That is, a calm, rational analysis of what is certainly a highly complex issue covering mental illness, drug use, religion, racism, disenfranchisement, immigration, and gun control. We didn’t get that, and we’re not going to. Unfortunately, as the gushing media shows (and social media comments) the chattering middle classes don’t want leading, they want mothering; that they celebrated Arden being New Zealand’s first prime minister to get pregnant in office should have served as a warning. It’s easy to see why women like her: she’s basically the president Mumsnet would have if it were a country. That men are on board with this shows how feminised society has become, despite the claims that women live under the jackboot of toxic patriarchy. If people don’t want to be infantalised by politicians they’re going to have to quit electing women who run on a platform of being mothers before anything else. Whats going on here is a morality play, not too dissimilar to those you see on Mumsnet where women describe a domestic situation in the hope others endorse their moral stance. Arden and her worshippers are signalling that they are the Good people, and over there are the Bad people. If this massacre hadn’t occurred they’d have just waited for the next one: the virtue signaling never stops, only this time it’s amplified for a global audience. By choosing who to sympathise with, who to demonise, and who to ignore the middle classes and their elected priesthood can demonstrate to each other how morally virtuous they are. This explains the staggering difference in reactions to an Islamic terrorist bombing children in Manchester – “don’t look back in anger” – and a white lunatic shooting up a mosque in New Zealand. It also explains why the story of a man of Turkish extraction murdering three people on a tram in Utrecht in broad daylight this week didn’t get much attention. Apparently the fact it might have “only been an honour killing” is reason enough to downplay it, as if that’s unrelated to issues surrounding alien cultures, immigration, integration, and violence – the sort of things the Christchurch shooter took an interest in, as it happens. Raised as a Mormon, a member of The Church of Jesus Christ of Latter-day Saints, Ardern left the church in 2005 because, she said, it conflicted with her personal views; in particular her support for gay rights. In January 2017, Ardern identified as “agnostic”. She’s not so much left the church as joined a new one, this confused jumble of sacred cows such as multiculturalism, environmentalism, and poor brown people which must be worshipped while denouncing temptations like conservatism, tradition, and pride in one’s culture (if you’re of European stock, anyway). So my view is this. Most people clearly want mother figures ruling over them rather than leaders, and they want comfort and lollipops instead of being forced to grapple with serious issues requiring tough decisions. Which is fair enough, and why not? A mother figure like Arden will preside over a much more pleasant society than that of, say, Attila the Hun. The trouble is, as I’m fond of saying, I’m not sure societies run by mother figures will last very long. If New Zealand over the past few days is any guide, I very much doubt it.